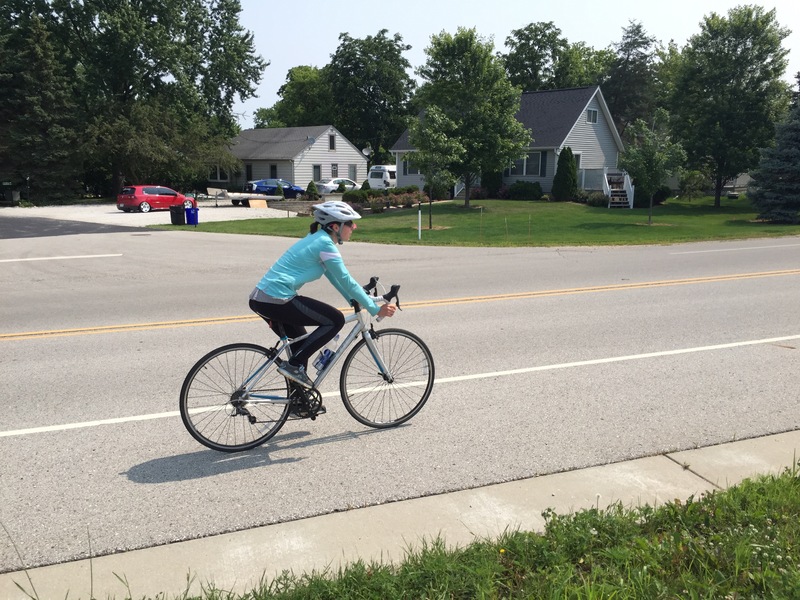 This is the third in a series of posts sharing lessons learned while bicycling more than 1,170 miles in preparation for the RAGBRAI bicycle ride across Iowa. You can see them all here. Without equipment (like, say, a bicycle) you won’t get very far. Without proper equipment, you will get there but you might not enjoy the ride. Road bikes are made for the road. Their skinny tires and longer wheelbases provide less rolling resistance and more stability. With no suspension they’re not designed to be cushy rides, but since they live on (theoretically) smooth blacktop they don’t need a lot of springs to take up huge bumps and holes. Mountain bikes are made for off-road. Their wide, knobby tires are made to provide grip. Lower gears mean they won’t win any speed trials but they will allow you to get up those hills and over any obstacle you encounter. Modern suspension systems help smooth out the rocks, roots, logs and holes you’ll inevitably encounter. No matter what type of riding, in what type of setting, you want to do, there is probably a bicycle made for it. 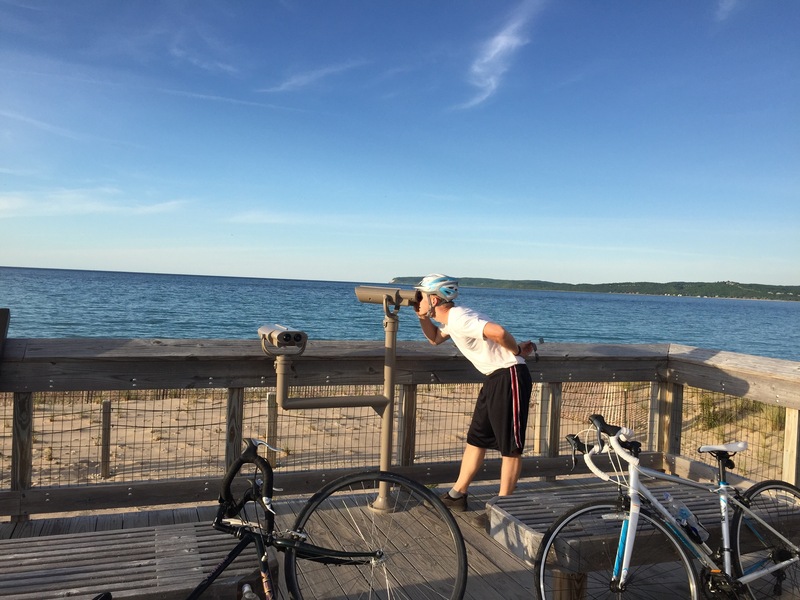 Road touring, mountain, BMX tricks, sprint racing, recumbent, and even one-wheeled unicycles! Don’t sell yourself short by just buying the cheapest set of wheels you can find. Research, talk to knowledgeable people at local bicycle shops, try out a variety of bike styles and sizes, and learn what will best fit you and do what you want to do. Then get the best bike. Yes, this might mean that you need more than one bicycle. Personally, I have two – a mountain bike for off-road and a touring bike for on-road. Both have their places and are appreciated when I use them. They are not interchangeable – I have ridden the mountain bike long distances and was exhausted the next day. 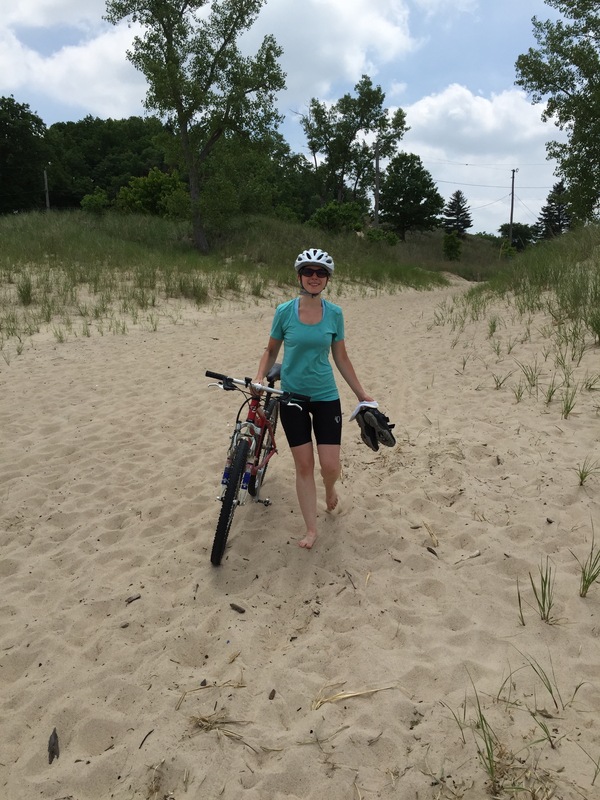 Likewise I have tried to ride the road bike through sand trails, without any luck. There are hundreds of bicycle accessories. And all of them have thousands of varieties. Once you start riding, if you’re anything like me, you will feel downright out-of-place when you don’t have all of the gear. So many other riders look like professionals in their clothes and with their accessories – you’ll feel like you stick out like a sore thumb. After 1,170+ miles, I still don’t have a jersey, spandex shorts, or bicycle gloves. While I can’t tell you what you do and don’t need, I can share what I find invaluable from the gear that I have. If you saw me ride past, you might notice that I’m wearing a wicking short-sleeved sport shirt from WalMart. Or spot the running shorts that I’ve had for years. Maybe you’d notice that I have on ye-olde running shoes sitting flat on my stock pedals – no fancy clipless pedals for this guy. You would see that I have on a helmet, at all times. 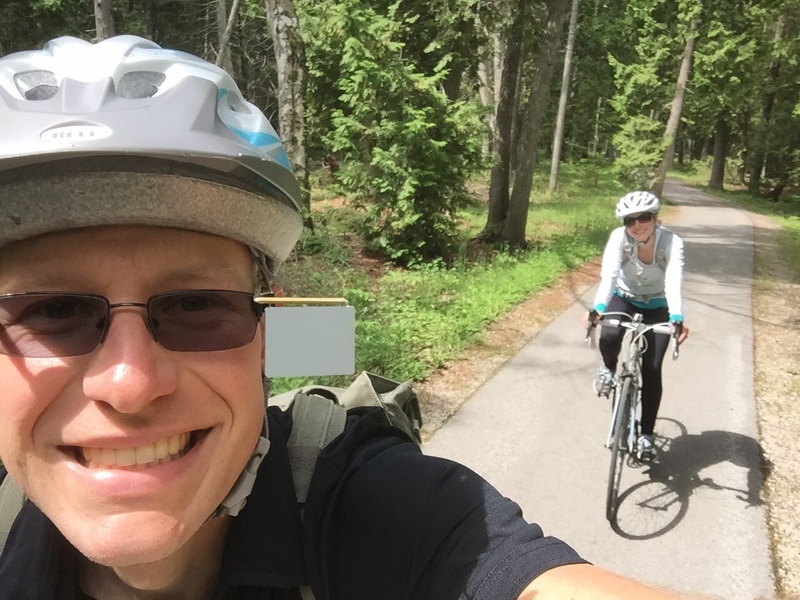 Likewise, I hate riding without my clip-on rear-view mirror (due to my handlebar configuration the only place for me to put a mirror is on either my helmet or glasses.) Unseen would be the padded bicycle shorts that are underneath my shorts – these things make world of difference and were less than $20 on Amazon. The water bottles in my two bottle holders are the same 23.7 oz SmartWaters that I picked up on a road trip months ago. They fit well in the holder and have an easily accessible flip-top lid that I can use while riding. Refill after each ride and I’m ready to go. I hear good things about riding gloves. And everyone seems to be wearing a jersey. What kind of a cave-man doesn’t use clipless pedals? Maybe there are benefits to all of the other accessories that I am simply unaware of. One day, I’m sure that I will test them out. Until that time, I am a biker because I pedal. Start with the bicycle and helmet, have fun, and build from there! My friend Tom, from The Practical Nerd, recently created an amazing resource. He emailed a number of extraordinary achievers and asked them what some of their ordinary achievements are. This insightful question allows us to see behind-the-scenes into their lives to teach us how much like us they are. Not only does Tom provide a great list of inspiring individuals whose accomplishments and goals include visiting every country in the world, pursuing 10,000 Random Acts of Greatness, and letting readers choose where they live for the next 4 months. He also helps us get a glimpse of just how ordinary these individuals are; some of their goals include graduating high school, eat breakfast on a daily basis, and the author who writes every day. This is the kind of post that you should bookmark and return to frequently. Look at the accomplishments by those mentioned for inspiration. See how they are ordinary people and know that you can do the same. Use it as a “to contact” list and meet new people. Check out the resources provided by those mentioned. Go, check out Average goals from extraordinary achievers. My wife and I currently live in a 2-bedroom apartment. That second bedroom? Designated as an office/art studio. The office part is true. It houses our school books, a massive desk that is used on a daily basis, and other sundry items. It also works wonderfully as an art-supply storage room. Most of my materials are carefully tucked away in corners and the closet. Unfortunately, storage was not at all the goal; action was. I came to realize that even though I never worked on any of my projects, I had a lot of great ideas. I even had the energy and a few minutes to spare to work on them. Unfortunately, the prospect of having to clear a workspace, drag everything out of storage, and then set it all up. After working, it’d be time to clean back up again. Out of those twenty minutes I had to work on a project, about 5 of them would be spent painting. The rest would be set up and clean up. And so, my projects never moved past the idea stage. As with so many problems, the answer to mine was quite simple. I needed to greatly reduce or completely remove the amount of prep and clean-up time required for each session. I needed a dedicated art-space. Fortunately for artist me, painting and drawing don’t require a lot of horizontal space. Vertical is the way to go. This means that I didn’t need another desk, but a place to put my canvas or paper. An easel! Egads! Easels are expensive. They range from $40 for a weak, wobbly thing to tens of thousands for easels that move on their own. I didn’t want anything fancy. Functional, sturdy, and easy on the wallet. While I’m at it, I also want it to be small and light-weight as well. Fortunately, such a contraption is surprisingly easy to make. An easel is nothing more than a capital “A” that is leaned up against a surface. Two pieces of $1.45 lumber, one piece of scrap wood, 6 screws, a 3 cuts… and I’m done. Total cost was about $3, and it took less than an hour. If I had power tools, it could be done again in about 10 minutes. My easel is a simple affair, but it fulfills my requirements, and means that I’m ready to pick up work on my current project with only a minute or two of preparation. Want to travel more? Don’t want to pay high prices to do so? Fortunately for all of us who do, Chris Guillebeau just launched the Travel Hacking Cartel. Maybe Monday’s post about Becoming a Frequent Flier Master piqued your interest. Here’s the chance to get more serious about it, to really earn those points and actually use them to go places! I don’t know about you, but I love the idea of getting to travel for free. My wife and I have a lot of places that we want to visit, and being able to get 4 free tickets a year, guaranteed! is definitely something we’ll be doing. I’m already a member of the Travel Hacking Cartel. Won’t you join me? Let’s go traveling! Do you wish that you traveled more often? Wish it didn’t cost so much? I’m right there with you. My to-visit list can be summed up into “everywhere”. However, I can’t afford to buy a plane ticket across the country, much less across the ocean. Fortunately for both of us, Chris over at the Art of NonConformity has written a fabulous guide to help us out. Chris knows a few things about traveling, and making it affordable, since he’s given himself 5 years to visit every country in the world (and has visited more than 125 of them thus far). 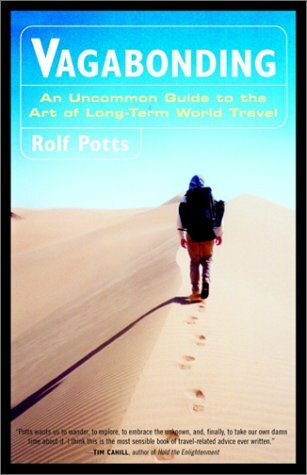 In this guide he has condensed the knowledge he has gained during more than 8 years of travels. No, you don’t have to actually frequently fly to make use of this guide, but it will help you be able to fly more often. There are numerous ways to earn frequent flier miles (almost half of which don’t involve having a credit card), and this guide comes with a fabulous “earn enough miles for a free ticket or your money back” guarantee. What more could you ask for? A risk-free chance to earn enough frequent flier miles to fly for free. I’m going to be putting the information in that guide to use, because I want to start actually visiting those places on my list. Dreaming about them just isn’t enough. What about you? Go check out the guide. Even though I haven’t mentioned it for a few months, I’m still not using soap or shampoo in my daily shower. I haven’t received any complaints about smell, or made any about feeling dirty. However, I have received some feedback because of my earlier post about the no soap or poo experiment and wanted to share. She didn’t try long enough to get past the normalization period. The more chemicals you use in your hair, the longer it will take for it to return to feeling normal without them. She likes how the shampoo smells and wanted that back. I can certainly appreciate this, and see no other way to achieve the same results. Another friend decided to test the no ‘poo experiment as well. After about a month, she thought that her hair still hadn’t normalized but was willing to continue on. A month later, she was still going. When she went to her stylist for a trim she received compliments on her hair. After explaining the experiment, the stylist remarked that the reader had exactly the results that so many people pay a lot of money to achieve. After reading about my experiment, a friend of mine decided to give it a try. I didn’t hear about it until after a few weeks of no soap. Like me, he hadn’t received any complaints and decided that he liked it just as well, if not better, than having to use soap. Since no soap seemed to be working for him, he decided to try no ‘poo as well. He waited until after he got his hair trimmed (which is still about twice as long as mine) and gave it a go. A week later he told me that he loved the results! He didn’t need to use any gel in his hair any longer, which he had been doing for years. A couple of friends read about the experiment and both decided to test it out. He had never given such an experiment any consideration and was quite pleased with the results. She has always had sensitive skin and struggled to find soap and shampoo that wouldn’t irritate her. No soap has proven to work out wonderfully for her! She isn’t quite comfortable testing out no ‘poo, though, and was still looking for a shampoo that works for her the last I heard. The most interesting thing that I learned from their experiences came from testing out no deodorant as well. He hasn’t ever been a huge user and skipping that daily step didn’t bother him in the least. She was a heavy user, however, and was amazed to find that she smelled better when she quit using it. Needless to say, she was quite annoyed to find out that Dove had been making her stink! Have you tested out either no soap or no ‘poo? I’d love to hear how it went, either in the comments or via email.